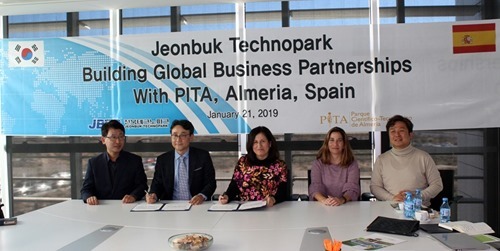 A delegation from Jeonbuk Technopark, South Korea, recently visited PITA Almeria, Spain, both IASP members. The visit aimed to improve collaborations between the companies of both parks, to support development and increase participation in joint projects focusing on agriculture and technology-based industries. The Korean delegation, led by Kwang-heon Lee, director of research at Jeonbuk Technopark, held a meeting with the director manager of the Park, Trinidad Cabeo and the director of Innovation, Alicia Cañadas. “We will work on the exchange of information to explore the possibilities of cooperation in agriculture and technology, to promote the internationalization of our companies. It is a long-term agreement in which we will continue to make contacts,” Cabeo said. Several Korean companies working in agriculture and biotechnology were also part of the delegation that visited PITA, the Unica Group company and the Tecnova technology centre, where they presented their products and services as well as learning more about PITA’s activities in the agrifood sector. PITA Almeria is also the coordinator of the IASP Agrifood subnetwork, a working group for IASP members who are active in the agriculture and environmental sciences sector. Agrifood is a growing sector that includes a wide range of processes, operations, and roles as food travels from the farm to the fork and is increasingly represented in science parks around the world. The subnetwork offers IASP members from across the world the opportunity to work closely together, share ideas, resolve challenges and create business opportunities. Find out more about IASP Agrifood at www.iasp.ws/our-members/subnetworks/iasp-agrifood.